“Oh, um, let me check.” I checked. “Well, um, let me check if they can do that.” I checked. “That was a good idea. I’ll make sure they keep a plate for you.” I hung up the phone a little exhilarated. Oh, what power was wielded from the throne of the front desk! No wonder these secretaries were always drowning in cookies and flowers; they are women in a position to Get You Things. This gentleman’s passion for the Mother of All Starches reminded me of a similar episode that had occurred a few years prior, during this same daughters’ elementary school days. I was eating lunch with her in the wet area one day, as all pathetic good mothers do, when a couple I knew came sauntering by, carrying pink plastic lunch trays loaded down with–you guessed it–Turkey Gravy. “Hey Jen, how are you?” The woman beamed at me as her husband caught up with her, both smiling and exuberant in the hallway. I wondered at their giddiness as I set my ham and cheese sandwich down to smile back. “Oh yeah! She’s been wanting us to come for awhile, but we kept telling her: you have to wait until Turkey Gravy Day–we want to come eat on Turkey Gravy Day!” They looked at each other and laughed, from merriment more than amusement. They were obviously thrilled to be participating in what I can only guess will, at some point, become a national holiday. “And may we ask what you are you doing eating a sandwich–on Turkey Gravy Day? !” They threw their heads back laughing and then–I kid you not– broke into a spontaneous little jig across the shiny gray tiles. 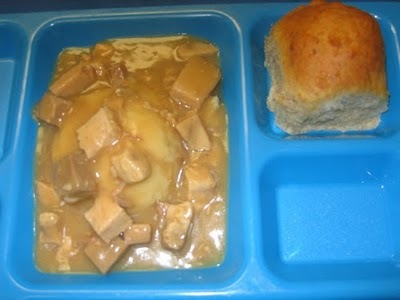 Their balance of the loaded lunchtrays was impressive; not a drip of that gelatinous brew slid over the edge. “Turkey Gravy Day, Turkey Gravy Day…we love Turkey Gravy Day…” This was half-sung as they swung their hips and bee-bopped down the hall to join their daughter in a familial culinary bliss. I looked at my quiet little sandwich and my quiet little daughter. I was impressed. At the tender age of ten, my daughter understood the Stockholm Syndrome. Give ’em the bad stuff, and eventually they’ll get excited about the not-so-bad stuff. Sure, it may just be Turkey Gravy, but at least it isn’t a mess of sticky, tasteless monosodium glutamate and caramel coloring. Previous Article Portrait of the Artist as a middle-aged mom. Next Article It’s like living with Karen Carpenter.